Wikiloc is a free web site which lets you share your favorite GPS tracks through a Google Maps mashup or through Google Earth. Its focus is on trails - and it shows the elevation profile as a graph with every track. Tracks can also have photos and video clips associated with them. Wikiloc won a Google Maps mashup contest in Spain in 2006, and continues to make nice improvements. The site's author, Jordi Remot, wrote me this weekend to say he has reached 10,000 uploaded GPS tracks. So far most of the users are in Europe, but he has very good multi-lingual support, so hopefully he'll get more users from even more countries. What I particularly like is that Wikiloc provides good Google Earth integration as well. You can view any GPS track you see on the site also with Google Earth. And, at the top of the web pages is a link to "discover GPS trails [Google Earth File. You must have GE installed.] " with Google Earth. This is a well done GE KML file which uses regions to pull in more tracks as you zoom into a specific location. It not only shows the icons, but also provides a sample of tracks right away. Placemark icons indicate the types of tracks (hiking, biking, skiing), and if you click on a placemark you get an option to display that GPS track, or view more info at the web site. 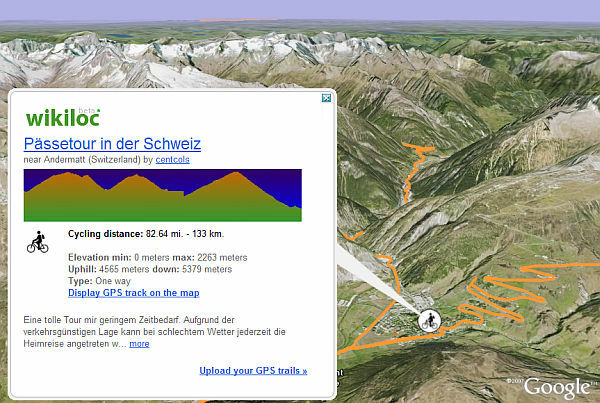 The placemarks also show the elevation profile. One other thing I like is that in the Google Maps mashups, Wikiloc also shows the Panoramio photo layer so you can see photos from other people for locations your viewing. Of course, you can also turn on this layer in Google Earth. It's a handy way to get more perspective for a particular trail/location. You might also check out the TierraWiki project which beyond enabling you to view your tracks also builds a trail map and enables downloading routes to your GPS.